With Thanksgiving just a couple of weeks away, it’s the perfect time to think about how to wow your guests during this year’s Thanksgiving party. As you work hard preparing a Thanksgiving dinner that will have even Chef Gordon Ramsay sing your praises, you can’t be faulted for not paying more attention to the dinner table itself. Worry not, however, because Treetopia has your bases covered with a few Thanksgiving tablescapes that will make any Thanksgiving dinner a delight—without resorting to clichéd themes that remind you of your grandmother’s house. A highly traditional occasion, Thanksgiving dinner is the perfect opportunity to exhibit your mastery of traditional and monochromatic colors. An all-white table setting exudes subtle elegance in all its simplicity and can further brighten up the already jovial Thanksgiving mood. Bring out the white chairs, table linens, and centerpieces to create an immaculate space fitting for your guests of honor. If an all-white scheme seems austere, you can use fall accents, such as small pumpkins, fall leaves, or seasonal blooms, as centerpieces. Use them sparingly, though; moderation is key if you want to highlight the understated beauty of white. You can also add some light brown accessories, such as table runners and place mats. Light some white candles and place them in the center of the table using white or clear glass candle holders to add some warmth to the table setting. The Thanksgiving dinner table, especially the scrumptious food on it, may be the focal point of the celebration, but that doesn’t mean you can neglect the small details. If you have time on your hands and a creative streak in you, paper cutouts are an excellent way to add a personal touch to your dinner table. Thematic napkin rings and strategically placed fall accents can make your table setting—and dinner itself—more inviting and memorable, especially with elements that you made yourself. String autumn leaf paper cutouts together into a garland and create some unique place cards for your guests for an origami-inspired Thanksgiving dinner. 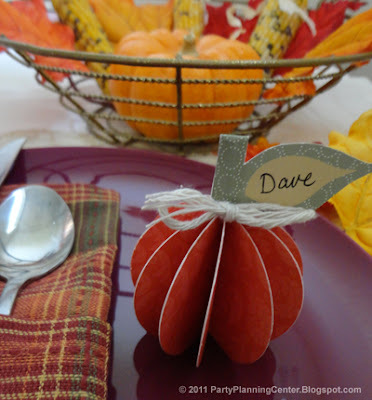 The paper pumpkin showed in the image above is a nice table accent for ushering in both Thanksgiving and autumn. Color plays an essential role in every table setting or design theme, whether you notice it or not. You can see this for yourself by purposefully making color a dominant element of your Thanksgiving dinner. For a modern take on a time-honored tradition, take advantage of some modern color combinations, such as orange and gray. Muted gray hues work well as a backdrop to the more vibrant shades of orange. The grays also complement the color of silverware, while the oranges do the same to the delicious food on the table. Because gray is a neutral hue, this orange-and-gray theme works well, whatever the color scheme of your dining area. Make Thanksgiving dinner a hoot this year by paying more attention to your dinner table, decorating it like you would your front porch or living room. With small touches of ingenuity and a generous helping of decorating flair, you can make Thanksgiving an exciting celebration and the perfect prelude to the coming holiday season.